Purrrrr...fect! 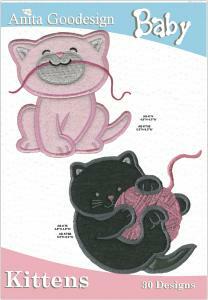 This Baby collection has cute, cuddly kittens ready for applique with minky and fleece to give them their soft, fuzzy appeal. What's not to love about a cuddly, playful little ball of fur! The designs consist of playful kittens rolling around with balls of yarn, hiding in baskets, bags and teacups. You will find these kittens perched in precariously playful poises as they hang from tree branches, and chase butterflies. This collection is purrrrr...fect for all your baby's needs such as quilts, diaper bags, bumper pads, wall hangings and mobiles. The associate who took my order was exceptionally professional and pleasant.